Thanks for making the Valley Publicity Summit a success! 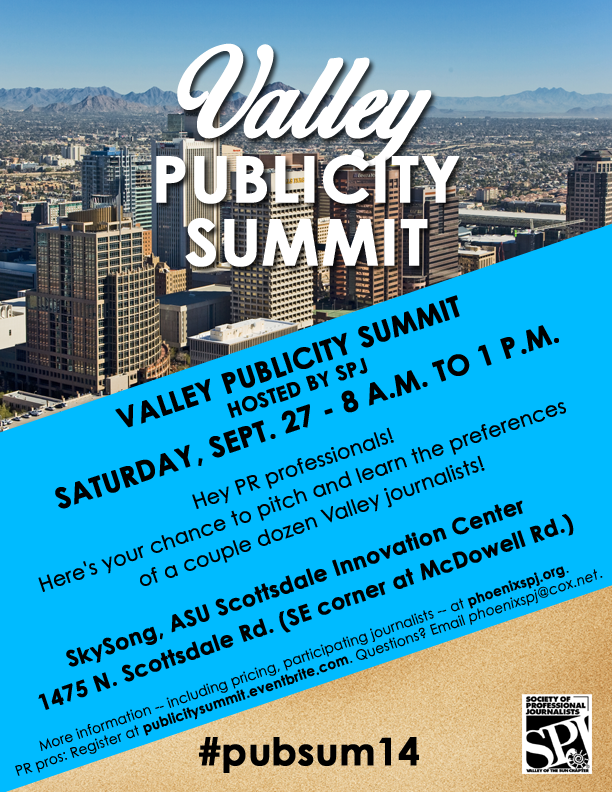 Valley of the Sun SPJ appreciates the 53 public relations professionals and 27 media representatives who participated in last Saturday’s Valley Publicity Summit, hosted by SPJ. We’re also grateful to Olson Communications Inc. for its sponsorship, to Phoenix PR Pros and IABC Phoenix for promoting the Summit, and for the ASU chapter of SPJ for volunteering at the event, which brought media people and public relations practitioners together to discuss story-pitch preferences. Proceeds will support the chapter and make a contribution benefiting the Phoenix-area public relations community. See you in 2015! This entry was posted in Events and tagged ASU SPJ, IABC Phoenix, Olson Communications, Phoenix PR Pros, Publicity Summit, thanks, Valley Publicity Summit by Valley of the Sun SPJ. Bookmark the permalink.